زعفران (.Crocus sativus L) گیاهی است که به منظور استفاده از گل و کلاله قرمز رنگ گل، با اهداف زیادی ‌از جمله مصرف در صنایع غذایی، رنگ و پزشکی کشت می‌شود. به علت با ارزش بودن گل، شناخت ژن‌های شرکت‌کننده در مسیر گلدهی یکی از مهم‌ترین مسائل این گیاه است، که با روشن شدن این مسیر می‌توان ابتکار عمل در نظم گلدهی و تا حدودی زمان گلدهی و عوامل محیطی مؤثر بر آن را در دست گرفت. برای کشف و شناخت بهتر از مکانیزم مولکولی مؤثر در آغاز گلدهی گل، به‌طور اختصاصی ژن و میزان بیان ژنPistillata-like MADS box (PIC2) مورد بررسی قرار گرفت. توالی این ژن همسانی بالایی با اعضای خانواده جعبه MADS (از عوامل رونویسی در بیان پروتئین‌های کنترل اندام‌های گل) دارند. در این پژوهش، ژن PIC2 با استفاده از منابع بیوانفورماتیک، مورد مطالعه قرار گرفت و آغازگرها جهت تکثیر این ژن طراحی شدند. در ادامه، cDNA آن توسط آنزیم رونوشت بردار معکوس ساخته‌شد و به عنوان الگو برای تکثیر ژن PIC2 در واکنش PCR مورد استفاده قرارگرفت. میزان بیان‌ژن PIC2 در کلاله گل بیشترین و در بنه زعفران کمترین مقدار را نشان‌داد. طی واکنش PCR قطعه‌ایی به طول ۹۰۰ جفت باز از cDNA و قطعه‌ای به طول ۱۳۰۰ جفت باز از DNA ژنومی تکثیر یافت. این قطعه ژنی، یک پروتئین ۲۱۰ اسیدآمینه‌ای را رمز می‌کند که دارای منطقه با توالی جعبه MADS می‌باشد. با تجزیه و تحلیل ساختار مولکولی پروتئین رونوشت شده و بر اساس مدل‌سازی همولوژیکی، شکل فضایی آن نشان داد که این پروتئین ساختاری منظم دارد. 1Department of Biotechnology, College of Agriculture, Torbat Heydarieh University, Torbat Heydarieh, Iran. Saffron is grown for using its flower and red color stigma. This plant has many uses in the food industry, paints and medicine. Due to its high monetary worth, identification of genes involved in the flowering is very important. In order to better understand the molecular mechanisms involved in the onset of flowering, Gene and gene expression of Pistillata-Like MADS box (PIC2) were studied. The Gene sequences have high homology with other family members of the MADS-box family (one of the transcription factors control the expression of proteins flowers). In this research, the gene was studied using bioinformatics resources. Primers were designed for amplification of the gene and then the total DNA and RNA were extracted from the leaves of saffron. cDNA synthesis was performed by the reverse transcriptase enzyme and it was used as a template for amplification of PIC2 gene by PCR reaction. The reaction was amplified to a fragment with length 900 bp from cDNA and another fragment with length 2100 bp from genomic DNA. This gene encodes a protein that includes 210 amino acids. By analyzing the molecular structure of protein transcripts based on modeling of the gene homology, the spatial figure showed that they have a regular structure. Ahrazem, O., Almudena Trapero, Gómez, M.D., Rubio-Moraga, A., and Gómez-Gómez, L. 2010. Genomic analysis and gene structure of the plant carotenoid dioxygenase 4 family: A deeper study in Crocus sativus and its allies. Genomics 96: 239-250. Ahrazem, O., Rubio-Moraga, A., Trapero, A., and Gomez-Gomez, L. 2012. Developmental and stress regulation of gene expression for a 9-cis-epoxycarotenoid dioxygenase, CstNCED, isolated from Crocus sativus stigmas. Journal of Experimental Botany 63 (2): 681-694. Alaey, M., Naderi, R., Khalighi, A., Vezvaeoi, A., and Salami, A.R. 2007. Study on effective components on the quantity and quality of genomic DNA extracted from Iran cyclamen, Pajouhesh and Sazandegi 73: 11-16. Ashraf, N., Deepti, J., and Vishwakarma, R.A. 2015. Identification, cloning and characterization of an ultrapetala transcription factor CsULT1 from Crocus: a novel regulator of apocarotenoid. BMC Plant Biology 15 (25): 1-12. Becker, A., and Theissen, G. 2003. The major clades of MADS-box genes and their role in the development and evolution of flowering plants, Molecular Phylogenetics and Evolution 29 (3): 464-489. Castillo, R., Fernandez, J., and Gomez-Gomez, L. 2005. Implications of carotenoid biosynthetic genes in apocarotenoid formation during the stigma development of Crocus sativus and its closer relatives. Plant Physiology 139: 674-89. D’Agostino, N., Pizzichini, D., Chiusano, M.L. and Giuliano, G. 2007. An EST database from saffron stigmas. BMC Plant Biology 7 (53): 1-8. Davies, B., Rosa, A., Eneva, T., Saedler, H., and Sommer, H. 1996. Alteration of tobacco floral organ identity by expression of combinations of Antirrhinum MADS‐box genes. The Plant Journal 4: 663-677. De Bodt, S., Raes, J., Florquin, K., Rombauts, S., Rouze, P., Theissen, G., and Van de Peer, Y. 2003. Genomewide structural annotation and evolutionary analysis of the type I MADS-box genes in plants. Journal of Molecular Evolution 56: 573–586. Edstam, M.M., Viitanen, L., Salminen, T.A., and Edqvist, J. 2011. Evolutionary history of the non-specific lipid transfer proteins. Molecular Plant 4 (6): 947-964. Emamzadeh, A.R., Hosseinkhani, S., Sadeghizadeh, M., Nikkhah, M., Chaichi, M.J., and Mortazavi, M. 2006. cDNA cloning, expression and homology modeling of a luciferase from the firefly Lampyroidea maculata. Journal of Biochemistry and Molecular Biology 39 (5): 578. Fernandez, J.A. 2004. Biology, biotechnology and biomedicine of saffron. Recent Research Developments in Plant Science 2: 127-159. Fernandez-Fuentes, N., Madrid-Aliste, C.J., Rai, B.K., Fajardo, J.E., and Fiser, A.S. 2007. M4T: A comparative protein structur modeling server. Nucleic Acids Research 35 (2): 363-368. Goff S.A., Ricke, D., Lan, T.H., Presting, G., Wang, R., Dunn, M., Glazebrook, J., Sessions, A., Oeller, P., Varma, H., Hadley, D., Hutchison, D., Martin, C., Katagiri, F., Lange, B.M., Moughamer, T., Xia, Y., Budworth, P., Zhong, J., Miguel, T., Paszkowski, U., Zhang, S., Colbert, M., Sun, W.L., Chen, L., Cooper, B., Park, S., Wood, T.C., Mao, L., Quail, P., Wing, R., Dean, R., Yu, Y., Zharkikh, A., Shen, R., Sahasrabudhe, S., Thomas, A., Cannings, R., Gutin, A., Pruss, D., Reid, J., Tavtigian, S., Mitchell, J., Eldredge, G., Scholl, T., Miller, R.M., Bhatnagar, S., Adey, N., Rubano, T., Tusneem, N., Robinson, R., Feldhaus, J., Macalma, T., Oliphant, A., and Briggs, S. 2002. A draft sequence of the rice genome (Oryza sativa L. ssp. japonica). Science 296 (5565): 92-100. Hartz, C., Lauer, I., Del Mar San Miguel Moncin, M., Cistero-Bahima, A., Foetisch, K., Lidholm, J., and Scheurer, S. 2010. Comparison of IgE-binding capacity, cross-reactivity and biological potency of allergenic non-specific lipid transfer proteins from peach, cherry and hazelnut. International Archives of Allergy and Immunology 153 (4) :335-346. Jodeir, S., and Dehghan Nayeri, F. 2016. Study of expression of the MADS-box transcription factors involved in flower formation in saffron (Crocus sativus L.). Cellular and Molecular Researches 4 (28): 488-499. Johnson, M., Zaretskaya, I., Raytselis, Y., Merezhuk, Y., McGinnis, S., and Madden, T.L. 2008. NCBI BLAST: a better web interface. Nucleic Acids Research 36 (2): 5-9. Kafi, M. 2004. Saffron (technology, production and processing). 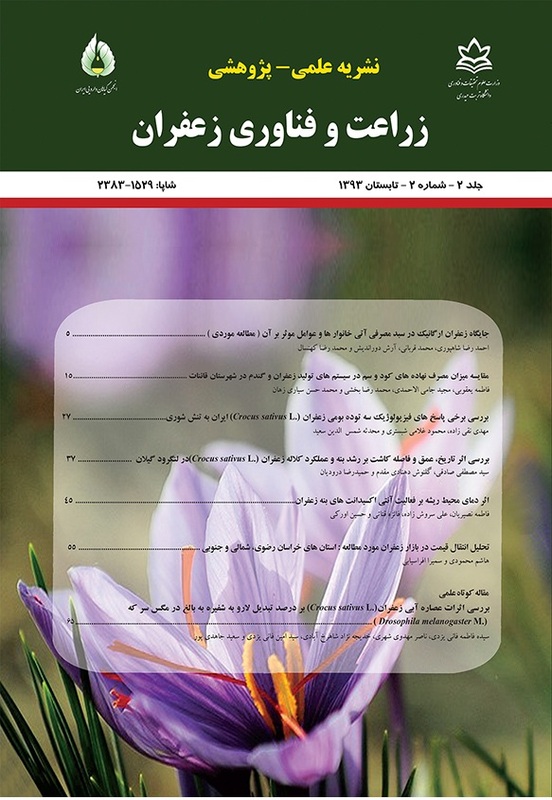 First Edition, Publication of Ferdowsi University of Mashhad. pp, 21-171. Kafi, M., Zand, E., Mahdavi Damghani, B., and abbasi, F. 2010. Plant Physiology. Fourth Edition. Publication of Ferdowsi University of Mashhad 676. Kalivas, A., Pasentsis, K., Polidoros, A.N., and Tsaftaris, A.S. 2007. Heterotopic expression of B-class floral homeotic genes PISTILLATA-GLOBOSA supports a modified model for crocus (Crocus sativus L.) flower formation. DNA Sequence 18: 120-130. Kolaskar A.S., and Tongaonkar P.C. 1990. A semi-empirical method for prediction of antigenic determinants on protein antigens. FEBS Letters 276 (1): 172-174. Mandel, M.A., Gustafson-Brown, C., Savidge, B., and Yanofsky, M.F. 1992. Molecular characterisation of the Arabidopsis floral homeotic gene APETALA1. Nature 360: 273-277. Masiero, S., Colombo, L., Grini, P.E, Schnittger, A., and Kater, M.M. 2011. The emerging iImportance of type I MADS-box transcription factors for plant reproduction. The Plant Cell Online 3: 865-872. Messenguy, F., and Dubois, E. 2003. Role of MADS box proteins and their cofactors in combinatorial control of gene expression and cell development. Gene 316: 1–21. Mihasan, M. 2010. Basic protein structure prediction for the biologist. Archives of Biological Sciences, Belgrade 62 (4): 857-871. Mohammad Hashem, F., Nikpour, P., and Emadi-Baygi, M. 2011. Evaluation and optimization of various procedures of RNA extraction from human frozen tissues. Journal of Isfahan Medical School 29 (133): 327-335. Moraga, A.R., Rambla, J.L., Ahrazem, O., Granell, A., and Gómez-Gómez, L. 2009. Metabolite and target transcript analyses during Crocus sativus stigma development. Phytochemistry 70: 1009-1016. Murry, M., and Thompson, W.F. 1980. Rapid isolation of high molecular weight plant DNA. Nucleic Acid Research 8: 4321-4325. Pelaz, S., Ditta, G.S., Baumann, E., Wisman, E., and Yanofsky, M.F. 2000. B and C floral organ identity functions require sepallata MADS-box genes. Nature 6783: 200-203. Sambrook, J., and Russell, D.W. 2001. Molecular Cloning: A Laboratory Manual. New York. Cold Spring Harbor Laboratory Press. 628 pp. Sarowar, S., Kim, Y.J., Kim, K.D., Hwang, B.K., Ok, S.H., and Shin, J.S. 2009. Overexpression of lipid transfer protein (LTP) gene enhances resistance to plant pathogens and LTP functions in long-distance systemic signaling in tobacco. Plant Cell Reports 28 (3): 419-427. Shakib, A.M., and Ainsworth, C.C. 2009. Expression study of four gene clones belonging to MADS- box family in the dioecious plant sorrel (Rumex acetosa L.). journal of Agricultural biotechnology1 (1): 1-18. Szczyglowski, K., and Amyot, L. 2003. Symbiosis, inventiveness by recruitment? Plant Physiology131: 935-940. Tsaftaris, A., Alexios, S., Polidoros, N., Pasentsis, K., and Kalivas, A. 2006. Tepal formation and expression pattern of B-class paleo Ap3- like MADS-box genes in crocus (Crocus sativus L.). Plant Science 2: 238-246. Tsaftaris, A., Pasentsis, K., Makris, A., Darzentas, N., Polidoros, A., Kalivas, A., and Argiriou, A. 2011. The study of the E-class Sepallata3-like MADS-box genes in wild-type and mutant flowers of cultivated saffron crocus (Crocus sativus L.) and its putative progenitors. Journal of Plant Physiology 14: 1675-1684. Tsaftaris, A.S., Pasentsis, K., and Polidoros, A.N. 2005. Isolation of a differentially spliced C-type flower specific Ag-Like MADS-box gene from Crocus sativus and characterization of its expression. Biologia Plantarum 4: 499-504. Tsaftaris, A.S., Pasentsis, K., Iliopoulos, I., and Polidoros, A.N. 2004. Isolation of three homologous Ap1-like MADS-box genes in crocus (Crocus sativus L.) and characterization of their expression. Plant Science 5: 1235-1243. Van Loon, L.C. and Van Strien, E.A. 1999. The families of pathogenesis-related proteins, their activities, and comparative analysis of PR-1 type proteins. Physiological and Molecular Plant Pathology 55 (2): 85-97. Varjonen, E., Vainio, E., Kalimo, K., and Juntunen-Backman, K. 2002. Clinical importance of non-specific lipid transfer proteins as food allergens. Biochemical Society Transactions 30 (6): 910-913.